Is it possible to have a perfect race? In my last blog, I mentioned that I had been suffering from some health issues. Once we had diagnosed the problem as an under-active thyroid, I was on thyroxine medication and started to pick back up again. Unfortunately, at the time it was only a few weeks out from Ironman Mallorca 70.3 and I made the tough but necessary decision to not race, and to focus on getting my health back to normal so I can optimise my training without running the risk of doing further damage. Instead, I spent a week training in the sun with friends, with a good few G&Ts thrown in – exactly what I needed. We introduced intensity back into the training programme and I was hitting all the numbers. So far so good. From here, it was only upwards as I spent the next four weeks working hard in training. My coach Mark Pearce came to visit for a couple of days and was pleased with how things were going. I was hitting all the pace and power targets and my form was solid. Woohoo, maybe I'll actually get to race my next race! During this time, I was also focusing much more on my health. Emma Risby from North Norfolk Nutrition had given me some sound advice about my diet, advising me to incorporate a far wider range of foods (with a focus on micronutrients) than I had been eating previously. I swapped out low value and gluten-heavy carbs such as bread, pasta and even white rice for far more nutritious grains, incorporated a really diverse range of fruits and vegetables into my diet, started consuming a lot more spices and herbs, and introduced probiotic foods such as kefir and sauerkraut. It seemed to do the trick, I felt super healthy, and combined with the thyroxine which was helping my metabolism, I lost 5kg. I have also been working with Matt Lovell, highly regarded sports nutritionist who runs AminoMan, providing supplements to help optimise recovery and general health. I have been taking an amino acid supplement which has been phenomenal – it works to repair cell damage overnight and reduce inflammation, and coupled with a few other supplements, my recovery has never been better. It seemed to all be coming together - in one week I had a PB FTP test, a breakthrough swim and my run was feeling very comfortable at threshold pace. 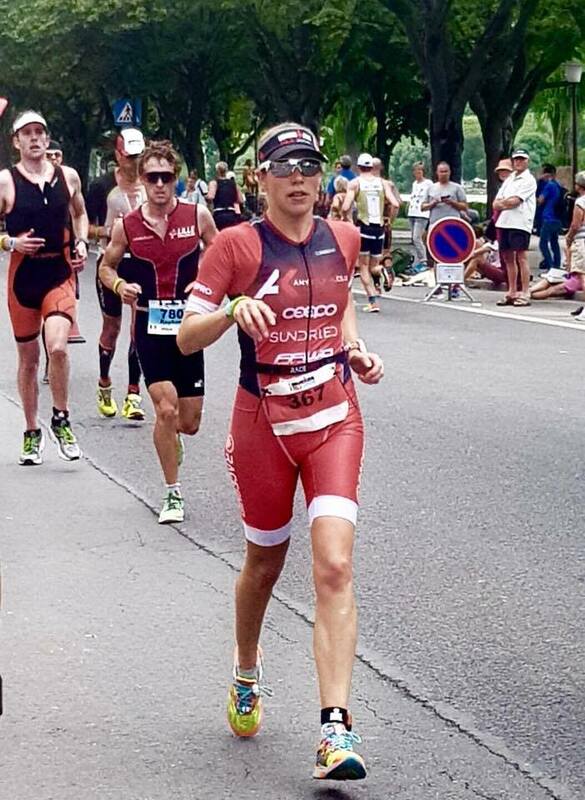 I felt like I was probably in better shape and better form than I had ever been in, so when I signed up to Ironman 70.3 Luxembourg a little ‘last minute’, I was excited to see what I could achieve there. I was meeting my friend Eloise who had convinced me that the race was brilliant, and I was so glad I did – it’s so much more fun racing with friends, when you have someone to share the whole experience with. Plus it helps dissipate the nerves pre-race and provides a fantastic celebration opportunity post-race! (cue even more G&Ts!). The swim was in the river Mosel, and after a nice casual rolling start, we were off. I had ambitiously positioned myself in the 25-30 minute start area, but as my fastest ever swim was 31 minutes I knew it would be a bit far-fetched! I felt like I was swimming pretty smoothly and moving through the water well, but I wasn’t busting a gut; I kept things pretty sustainable as I knew from experience that a few minutes in the swim wouldn’t make that much difference – and I’m not a natural born swimmer at the best of times! As I approached the swim exit I thought that if I had swam under 32 minutes or thereabouts, I would be happy. I could not believe the time on my watch when I looked down – 28 minutes!? That was a HUGE PB, by a whole three minutes! I was elated, and it spurred me on as I raced through T1. The first 36km of the bike course were, in fact, pancake flat, so I was in a good position at the start of the bike leg. I wasn’t overtaken by a single female (and was overtaking a lot of guys too); it felt like I was flying. Then we hit the climb. Masses of men (and a few women too) came cruising past me, not the least bit surprising! I felt pretty solid though and stuck to my power targets without burning too many matches this early on in the race. I hit halfway where I usually feel like I'm borderline dying, but not this time. Quick body check, and yep, all still feeling good. What the hell is going on!? The last 10km of the bike was flat again and I kept the hammer down, hoping for a sub 2:40 bike split. I came in at 2:41, but with a normalised power PB for the course, I was happy with that. You usually know how your run is going to go in the first few steps as you run out of T2. During my last two half ironmans this year, I knew straight away that the run was going to be a case of hanging on by a thread. Not this time. I ran out and was flabbergasted at how good my legs felt. I was trucking along at my threshold half marathon pace thinking to myself “this feels too easy.” It was disconcerting, but I was taking it! I was telling myself just to get to 5k before I get too excited. I was having to hold back, thinking that this pace was ridiculous (for me), and not sustainable. “There’s still a long way to go, just take it easy.” When I got to 5k and was still feeling utterly fantastic, I told myself to "just get to 10k". I got to 10k and had only slipped about 5 seconds per km, probably more because I was just relaxing into the pace than because I was finding it tough. It was still feeling stupidly comfortable. This cannot be right. The last 5km felt a little bit more of a struggle (as indeed it should), but I wouldn’t say I was hanging on like so many of my other races. In fact I was very far away from hanging on. I had slipped a little more, maybe 10 seconds or so per km, and was happy with that pace so just held it there. I was feeling a little delicate in my stomach so wasn’t managing much in the way of gels, but more because I was worried that if I made myself feel sick or caused stomach cramps, I would have to slow down, and I was so happy with my pace I wanted to avoid that at all costs! Must. Keep. Going. I finished strong in 1:41, a PB run off the bike for me. My finishing time was 4:56, I could not believe I had managed to go sub-5 hours on a hilly course in close to 30 degree temperatures (although we all know I’m good in the heat!). I hadn’t anticipated that for this course, not at all. I was SO happy. I met Eloise who had also had a storming race after a year and a half of injuries; it was an amazing feeling. I was 6th in my age group which was a little disappointing but I couldn’t have asked more in terms of how my race went. I felt like I had executed it perfectly. Of course there is always room for improvement but that was about as close to a perfect race that I have ever experienced. I was on a high. I finished as 10th overall female age grouper and 24th female including the pros, so I was pretty happy with that performance on the whole. Post-race celebrations were wonderful, I was so pleased to be back feeling normal again. Thank you to everyone who supports me, sponsors, friends and family – these are the moments we aim for in the sport, those utter feelings of elation knowing we have finished a race which truly reflects our performance potential, and I couldn’t do it without the amazing people who continue to help me. Here’s to many more like that one…. !